View More In Generator Accessories. FINALLY! THE LENGTH YOU NEED. Whether you're an experienced camper or a novice, you'll run into a variety of situations when setting up your RV or camper, and it helps to have an RV extension cord that can accommodate the trickiest setup. Never be caught unprepared. 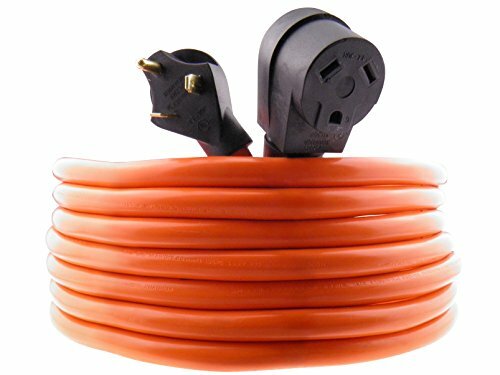 Order one or both of these 30a RV cords to ensure easy reach to power boxes and generators. ...equals peace of mind on your camping trip.This RV cord is as reliable as it gets. The last thing you want is a short. MPI Tools gives you the security of knowing you're safely plugged in so you can think of more important things. Like who packed the steaks. An RV electrical cord should never be an inconvenience. If you've ever experienced the struggle of getting a cord to reachorplug easily into an outlet, you can rest assured knowing you've finally found an RV plug that makes things easy. MAKE PLANS FOR THE WEEKEND AND BUY THE PLUG YOU NEED TODAY. CLICK THE "ADD TO CART" BUTTON NOW! ★25-FOOT AND 40-FOOT LENGTHS -Two lengths to choose from help ensure you're prepared for any situation. ★HIGH QUALITY CORD THAT WILL LAST -The last thing you want is a short. This cord is made from 10-gauge, 100% copper wires.The highest quality cords made to last! ★3 PRONG -Enjoy better electrical equipment and auxiliaries from MPI Tools. ★MAXIMUM FLEXIBILITY -This cord isn't stiff and won't cause you frustration during your set-up. If you have any questions about this product by MPI Tools, contact us by completing and submitting the form below. If you are looking for a specif part number, please include it with your message.